Armament: one 20mm M61A2 Vulcan six-barrel gun with 480 rounds; two AIM-9M/AIM-9X Sidewinder IR-guided missiles in internal side bays. 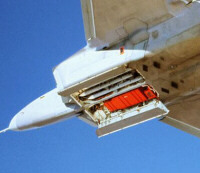 Up to six AIM-120C AMRAAM missiles in internal fuselage weapon bays, or two AIM-120C AMRAAMs and two 1,000 lb (450 kg) JDAM or eight 250 lb (110 kg) GBU-29 Small Diameter Bombs. Up to four fuel tanks or alternatively up to eight additional missiles can be carried on four optional external under-wing hardpoints.